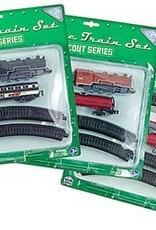 These easy to use train sets combines big fun with big value and are sure to delight even the littlest engineers! 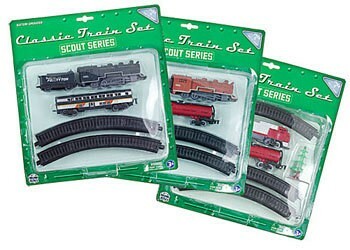 These durable yet highly detailed sets are sold in an assortment of steam and diesel locomotives that haul a variety of cargo and passenger cars. Each set comes with 8 sections of track that easily click together to make a large 6-foot circle, plus the back of the package features railroad history facts for kids.